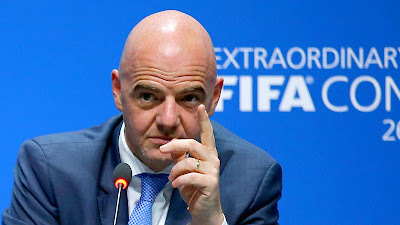 Fifa president Gianni Infantino will meet senior football association leaders from across Africa on a two-day working visit to Nigeria in July. The Nigeria Football Federation (NFF) said on Monday Infantino will arrive in Abjua on 24 July and will meet "a legion of African FA presidents". Infantino, elected in February this year, will be accompanied by new Fifa secretary-general Fatma Samoura. NFF president Amaju Pinnick met Infantino for talks in Paris on Sunday. "The Fifa president and secretary-general will arrive in the Federal Capital Territory, Abuja, on Sunday 24th July on a two-day working visit to Nigeria," Pinnick said on the NFF website. The statement said the Fifa officials will meet Nigeria's President Muhammadu Buhari and hold a meeting "with a legion of African FA presidents, who are expected in Nigeria" at the same time. Nigeria is seen as one of the giants of African football even though the Super Eagles failed to qualify for the Africa Cup of Nations finals for the second time in succession. The NFF has been dogged by factional disputes over its leadership and Fifa has threatened Nigeria with suspension from international competition because of irregularities in the leadership voting process.